As my prayer vigil raged on late into the night, I feared the worst for our boys Noah Syndergaard, Yoenis Cespedes, and Zack Wheeler. The Mets were indicating they wouldn’t have an update on any of the guys until today. Ray Ramirez couldn’t update the fans because he was too busy running from room to room at the Hospital For Special Surgery asking each of the players to provide another stool sample for his “collection”. Then after 10pm, the first bombshell finally dropped. 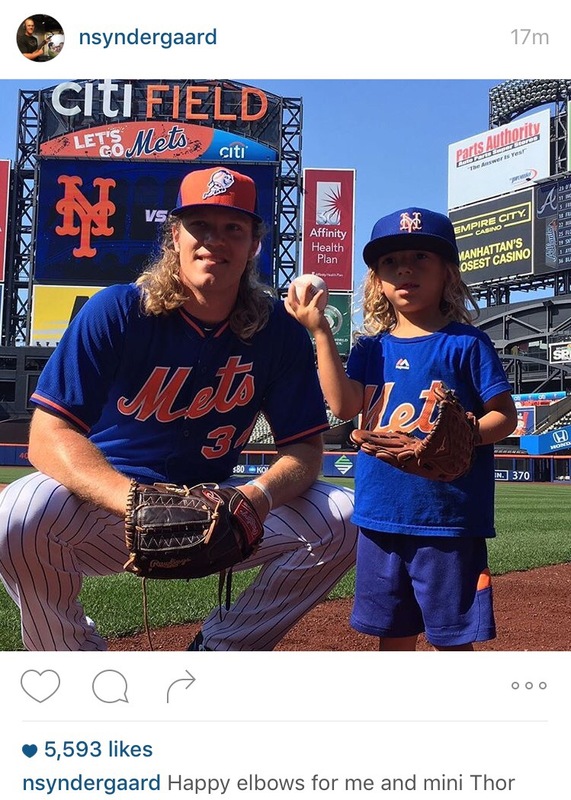 Thor posted the above photo on Instagram. “Happy elbows” was all I needed to hear. Then, just before 11pm the Mets dropped the news on SNY. All three guys are fine. Praise Jesus. Thor’s MRI showed no elbow damage, and he was cleared. Yoenis Cespedes was diagnosed with a mild sprain of his left wrist. He got a little cortisone and will take a couple days off. Zack Wheeler just had some nerve irritation in his elbow. He got a cortisone injection too, but his elbow structure was fine. I’m sure the Mets will handle all three of these guys with care, but for another day we can all breathe a sigh of relief. Our two best players are alive. The season isn’t over. P.S. The Nationals are finally hitting a rough patch. They’ve dropped five straight games and three straight in LA to the Dodgers. Michael Taylor went 0 for 5 (5 Ks) last night and misplayed a ball that led to the game winning run. He turned a single into a three base error and a loss for the Nats. Can the Mets please take care of the Braves in this four game set? Please? Let’s try and limit the setbacks. I think we’ve reached our quota for the week.